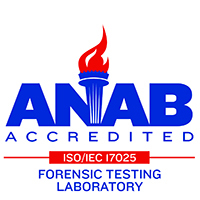 Our criminal forensics experts have worked with more than 400 law enforcement agencies throughout the United States and abroad and are qualified in 27 states and the District of Columbia, as well as in New Zealand, Bermuda and the U.S. Virgin Islands. We are committed to delivering services that not only meet, but exceed, regulatory requirements and client expectations for value, consistency and reliability. Accredited by ASCLD/LAB for primer GSR analysis and gunshot distance determination. The only private laboratory in the United States accredited by ASCLD/LAB-International for gunshot distance determination. GSR sampling of skin, clothing and other surfaces. Exceptional turnaround time for GSR analysis including backlogs. Initiated the use of computer-controlled scanning electron microscopy in the identification of GSR particles. Review and critique of reports and data from other laboratories. Actively involved in the development of criteria for standardized procedures. To view the Forensic Services handout, please click here. To view the Trace Evidence handout, please click here. Read blog posts, case studies and more about Criminal Forensics here. Learn about our laboratory services here.